A master clock is a hardware device that synchronizes slave clocks over a network. The Global Positioning System (GPS) is often used as a source of accurate time. Synchronization of slave clocks is achieved using the Network Time Protocol (NTP). Integrated high-stability TCXO or OCXO oscillators can be used to maintain accurate time. What is a Master Clock? A master clock is a hardware device that maintains accurate time and synchronizes slave clocks. The master clock acts as a time reference for a number of slave clocks that rely on it. External hardware time references, such as GPS and GNSS, are often used by master clocks for synchronization. Many relatively simple low-cost slave clocks can be installed and synchronized to a single more complex master clock device. Hardware costs are lower due to the hardware complexity of obtaining and maintaining accurate time is only necessary on a single device. What are Master Clock Systems Used For? Master clock systems are used in many different applications. Anywhere that a legally traceable source of time is required. Typical applications generally fall into two groups – event logging or event sequencing. Event logging provides proof of when an event took place. Examples include: CCTV systems, financial transaction processing, manufacturing processes. Event sequencing ensures that controlled events occur at an expected time. Examples include: SCADA systems, control of industrial processes, power generation. Master clocks need to synchronize to a source of accurate time. There are a number of time references available for master clock synchronization. Global satellite and navigation systems (GNSS, GPS), radio time and frequency broadcasts (MSF, DCF, WWVB) and also internet time references. There are many sources of time available on the Internet. Many are completely free of charge. However, they can have a number of drawbacks. In order to contact an internet time server, you need to leave a port open in your firewall which can cause security issues. Additionally, a very precise time is difficult to achieve due to the round-trip delay of packets transferred around the internet. Many Internet time servers can be incorrectly configured and do not necessarily provide a guarantee of accuracy. Many countries have radio time and frequency broadcasts that can be used for timing. The most well know being MSF-60 in the UK, DCF-77 in Germany and WWVB in the USA. These broadcasts have a finite range, generally limited to the country of origin. Additionally, signal reception in towns and cities can sometimes be challenging. Global Navigation Satellite Systems (GNSS) are a much better solution. Global Navigation Satellite Systems provide navigation and positioning information with global coverage. The systems are satellite based and include GPS, GLONASS, Galileo and Beidou. GNSS systems provide very precise timing information with world-wide reception. GPS master clocks receive signals only from the US Global Positioning System (GPS). Multi-GNSS master clocks can receive signals from multiple satellite systems to provide redundancy and enhanced reliability. Often multiple time references can be configured, such as GPS and Internet, for redundancy and to improve reliability. A high stablility oscillator can be employed in order to maintain accurate time in the event of loss of synchronization signals. TCXO or OCXO oscillators can maintain time to within a few milliseconds over a 24-hour period. The oscillators are often disciplined by GNSS signals to provide even better stability. Master clock systems provide time to slave clocks over a network. Older master-slave clock systems used pulse generators to synchronize slave clocks. Later, serial networks, such as IRIG-B, were introduced to transmit time to many slave clocks over a single cable. Most modern clock systems rely on Ethernet links to transmit synchronization signals. Network Time Protocol (NTP) is an IP protocol designed for the transfer of time between a master and slave clocks. It is one of the oldest and most widely used Internet protocols. 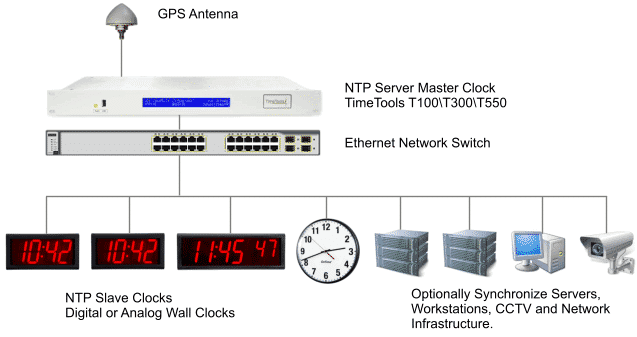 Any NTP or SNTP client or slave clock can synchronize to a NTP server or NTP master clock. Devices such as CCTV cameras, Digital Video Recorders as well as Windows and Linux servers and network devices such as routers all utilize NTP. A more recently developed time transfer protocol is Precision Time Protocol. PTP was developed to achieve sub-microsecond synchronization of clients, making it ideal for scientific, measurement and control systems. However, most timing applications can be fulfilled using the far simpler Network Time Protocol (NTP). Slave clocks can include anything from a Windows or Linux server or workstation to network infrastructure such as switches and routers. Additionally, many network devices, such as CCTV cameras use the NTP or SNTP protocols. NTP synchronized wall clocks provide a low-cost means of providing a display of accurate time throughout an organization. Available as digital or analog models, the wall clocks synchronize to a NTP master clock to display a consistently accurate time. The clocks are ideal for schools, hospitals, emergency services and broadcasting services, anywhere an easily visible reliable time is required. TimeTools has a range of GPS and GNSS Master Clock Systems that can be used to synchronize a wide range of devices. Additionally, our NTP slave clocks can provide an accurate display of time throughout an organization. Contact us for more details.